Installation - Could not create a new page. It already exists. I'm installing mediawiki in IIS on Server 2012 R2. I am using SQL Server. 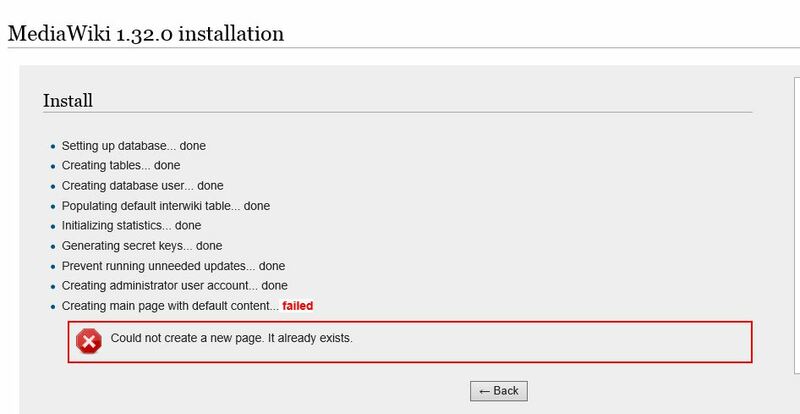 After completing the installation form and starting the install the process fails with Could not create a new page. It already exists. If I choose back I need to drop and remake the database so that the creating tables routine doesn't fail, but if this is done the install stops at the same point with the above error. This is the same if I choose to restart installation. I have fully deleted mediawiki and extracted a new copy to the folder IIS expects it to be in and I leave the web.config file. After this i get the same error as above. I'd appreciate any help or advice. Thank you! SQL Server is not well supported for MediaWiki. Apparently this is another bug for SQL Server support, which is already tracked on MediaWiki's phabricator as task T214055. I finally got this working. I want to point out that I had around 5-10 significant issues on a FRESH install that would've been impossible had each not been addressed. I'd be extremely curious if anyone got all the way through an mssql setup without any issues or code fixes. Some more minor issues I'm working on. I have a patch I'm working on testing, far from production, but will be enough to get MSSQL working for folks to play around with it. Very cool Tool/Website/software!! I think my patch may be controversial so I wanted to share it informally - eg, A particular error may be better fixed: in the php code OR the db schema. And without knowing the apps code thoroughly, I have no clue any consequences it may have either on the bug side, security side, or causing issues or compatibility down the line. I'm also sure its possible it would break things if one put this patch for a different database, like mysql. I saw numerous db data type errors where the SQL query wasnt playing nice, and complaining about requiring a cast or whatever since it expected a different data type (ie the query expected a varchar datatype, but the db was varbinary). So I dont know what the best OFFICIAL fix would be. My expertise is much more on the environment side than on the PHP programming side. Again, I came up with this patch because I was excited to get this up and running, and shared it so others can play around with this. Also, over many years I professionaly supported webserver(Apache & IIS)/php/mssql environments, and it came to mind that the sql:php drivers alone varied quite a bit. There were many file versions for the dll, as well as numerous php extensions for sql integration, such as pdo, odbc just to name a few. Point here, is this could explain the erratic behavior between one user to another while trying to set this up in a "IIS:PHP:MSSQL" environment, for example, because that's still way to ambiguous. Ie, what mssql driver and file version is one user using to connect to PHP? I have a specific question though, since many of the mssql bugs relate to one thing: whether it should be fixed in php or on the db schema side - Where should that dialogue exist? (If its on the db schema side, we need to change the data type from varbinary to varchar for many columns, or perhaps all - this would easily fix a large majority of mssql related bugs without touching the code - Alternatively, if "MediaWiki" feels this is the correct datatype and the fix needs to be in the php code, then we need to add CONVERTs everywhere it fails due to the data mismatch between a string & the binary datatype.) I'd like to know where "we" stand on the correct fix, so I do that, and not the "wrong" way. Then perhaps my patch (which is growing by the day) will a little more accepted. Thanks!!! We got a large spam attack in phabricator recently, maybe now accounts take longer to be accepted. I'm sorry this is happening to you. Best you can do is to get into the wikitech-l mailing list and explain both the problem with the phabricator account and your ideas or questions about how to better fix those mssql issues. That list is focused on developers and I'm sure you'll get very good advice about that. I'm going to ping @AKlapper (WMF) who can speed up the activation of your phabricator account and maybe review if there's something wrong in the acceptance of new contributors. Thanks a lot for the ping and sorry for the inconvience! Approved your Phabricator account (but I'm afraid that creating a Developer Account to put patches into Gerrit might also be limited for another one or two weeks). Reply to "Installation - Could not create a new page. It already exists."